Visit Jeep for more information on the Jeep Wrangler Unlimited. The Jeep Wrangler Unlimited returns for 2009 satisfying those who have always wanted a Jeep Wrangler but also need more space. This four door SUV can comfortably seat five adult passengers and has the most cargo space ever offered on a Wrangler all without sacrificing fun, freedom and class-leading off-road capabilities. There are three models available to choose from the 2009 Jeep Wrangler Unlimited X, Wrangler Unlimited Sahara and the Wrangler Unlimited Rubicon. The wheelbase of the Wrangler Unlimited is 20.6 inches bigger than the standard Wrangler - this allows for wider rear seating and substantially more occupant and cargo room. Front seat occupants will enjoy 54.6 cubic feet of room. When extra storage space is needed the rear seats fold flat to produce 83 cu. Ft. of storage room. An under floor storage area is also present to stow items out of sight. The Jeep Wrangler Unlimited is the only 4v4 convertible on the market. The Unlimited keeps the clearly recognizable Jeep look of the Wrangler while adding two more doors for expanded accessibility. Present are the classic Jeep features such as the seven slot grille, round headlights, wide wheel flares, fold down windshield and removable tops. There are several tops available. The Sunrider top comes standard to all models and has a sun roof as well as full top down option. Also available is a three piece removable panel hard top called the Freedom Top - a panel over the front driver, one over the front passenger and one over the rear passenger seating are independently removable creating several open-air combinations. All models are powered by a 3.8 liter V6 engine that cranks out 202 horsepower and 237 lb. ft. of torque. Standard on all four-wheel drive models is a six-speed manual gearbox - a four-speed automatic transmission comes standard on the two-wheel drive models and is available for the four-wheel drive models. The 2009 Jeep Wrangler Unlimited is loaded with safety features such as Brake Assist, Brake Lock Differentials, advanced multi-stage driver and front-passenger air bag, Hill Start Assist, Electronic Roll Mitigation (ERM), Electronic Stability Program (ESP), Tire Pressure Monitoring and more. 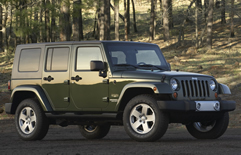 Get a Free Price Quote on a Jeep Wrangler Unlimited.